How I made my first game in under 48 hours! I did it! I made my first game and participated in my first Ludum Dare all in one weekend. If you’re not familiar with Ludum Dare, it is a themed game jam where people all over the world create a game from scratch in 48 (or 72) hours. A new jam/compo happens every 4 months, and I have a few friends who take part almost every time. I’ve wanted to try my hand at it since I started learning to program. Thankfully the stars aligned and I was finally able to participate in Ludum Dare #38! Have an awesome fun experience! How am I going to actually finish this by Sunday night? What is going to go wrong at the worst moment? 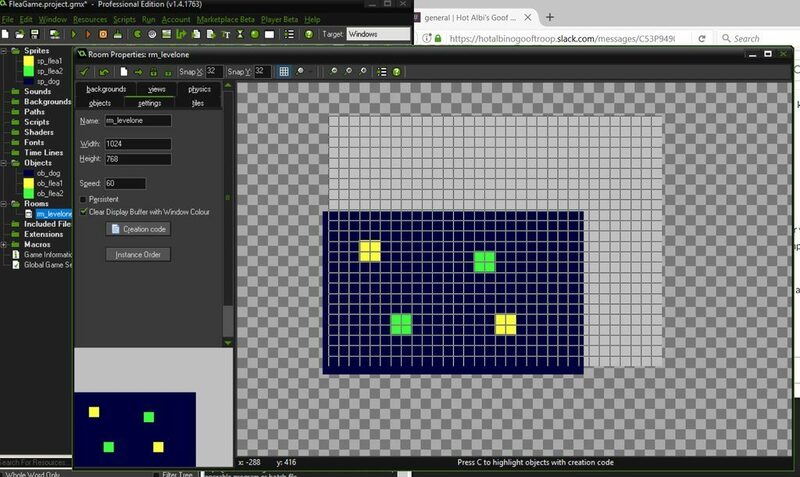 Watch some basic GameMaker Studio tutorials for beginners! I made a list of simple types of games that would be easy for a beginner. Some that came to mind were: Pong, Space Invaders, point-and-click, avoid/collect and perhaps a soundboard. Before I knew it, the clock struck 21:00! I actually did vote +1 for this theme because I knew I could work with “A Small World” with any of the beginner game tutorials I had researched. However, all of the themes in the last round of voting seemed definitely doable. 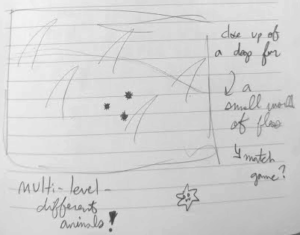 With my initial brainstorm time-box being a humble half hour, I started sketching and making notes immediately. To be honest, I love a good creative brainstorm where the only rule is: nothing is off limits. 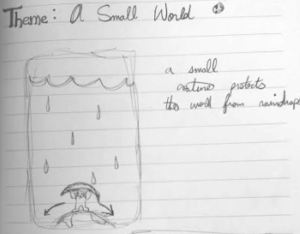 I followed advice from a Ludum Dare alumni: “Write down the first thing that comes to mind – it’s likely the idea everyone else will be doing, so keep thinking!” By 9:20 I had come up with a few ideas that seemed fun! A Space Invaders-style (ish) game! An animal-like alien stands atop a planet. He holds a leaf over his head and protects the small world from acid rain droplets. Inspired by old Neopets flash games where you basically just move side-to-side catching items as they fall to the ground. 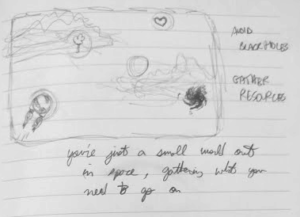 The player controls a small planet-turned-spaceship, flying through space to gather needed resources and avoiding black holes. Subconsciously inspired by those episodes of Invader Zim where Mars is a spaceship (Battle of the Planets). An extreme close-up on a dog’s fur reveals a small world of fleas. They love their environment and thrive on finding a mate to reproduce. The dog doesn’t seem to mind. I was feeling really good about the matching game, it seemed fun and hopefully simple enough to complete within the 48 hours. I used the drag-and-drop system in GameMaker: Studio Pro to make a quick “mock up” of how sprites and objects might work together, then went to bed to prepare for an early morning! Head on over to Part Two, where the real coding begins and I almost give up before I ever really got started! Thanks for visiting Daisy Chubb Codes! The blog began years ago as a tea review blog with recipes, if you were an old subscriber, thanks for coming back! My path had lead me to the tech world, so I’m keeping track of projects to keep me inspired and celebrate what I learn. There will still be lots of tea – it would probably take me years to drink my collection so I dare not quantify it. Maybe I’ll write a program to do that for me!